This is the end of your fat loss journey, and the beginning of your new lean self. EVER have before -- and you'll do it ALL in just 4 short weeks. I sat down to write you this letter because I'm inspired, and I'm onto something that can truly change your life. In the end, I realized there's no better way to prove this to you than by actually teaching you everything there is to know about accelerating the fat loss process, and why it works so well. We're talking about another level of fat loss and body transformation. The way most workout programs are designed is by deciding which muscles to work today, and how to best set up your program to hit everything eventually; all of this while stimulating the greatest "metabolic" effect. The problem is, you're already off to the wrong start. There Are 2 Ways To Stimulate Muscle And Increase Your Metabolism, Not Just One. Recruit, Load, Distribute, Stack. This ensures progression, by the use of Fat Loss Stacker Principle. First, we recruit a muscle or group of muscles, then we add a load to the muscle, redistribute our weight, and add a second or third exercise into the mix before completing a rep.
1 Squat + 1 Lunge = 2 exercises. Now, let's say you take those same 2 exercises, except you add a movement to exercise #2, and you leave the rest the same. 1 Squat + 2-part exercise = 3 exercises. You get the idea. We can really build a lot more into a lot less time when we learn to add exercises together. Fat loss skyrockets, as does the metabolic effectiveness of every exercise. Stacker Fat Loss Technology wins. With the unique progression built in to the Quadruple Neuro Fat Loss Stack™, we strategically prime your body to lose more and more fat each and every week, unlike typical fat loss programs in which results decline each week until you eventually hit a dreaded fat loss plateau. Can you just imagine losing even MORE fat in week 4 than you did in week 1? That's exactly what we do with Full Throttle Fat Loss - instead of plateauing, you'll be stacking your results from week to week until you hit Full Throttle max speed in week 4. Your Body Fat Doesn't Stand A Chance! Listen, I've invested hundreds of thousands of dollars into my education in fitness, health, and rehabilitation; more importantly, it took me years to get this far, and tens of thousands of clients trained. I truly believe I can advance you to 'master-level' knowledge in your own body and how to make it lose fat within 16 short weeks in Full Throttle Fat Loss. Full Throttle Fat Loss was created out of the realization that fat loss could (and should) happen much faster for everyone, not just some people. Sure, if you're perfectly coordinated, familiar with working out a specific muscle instead of movement, and already know how hard to push yourself, you'll probably get results. The trouble is, this only represents a small portion of the population. That's why I created a program that works for both beginners and advanced trainees, progressing exercise skill level at lightening speed, regardless. You're about to look, feel, and move differently. People will notice, but, more importantly, YOU will notice. You're going to wake up one day in the next 8 weeks and bounce right out of bed. You'll feel light on your toes, strangely happy for no apparent reason, and ready to charge at your day. As you glimpse at yourself in the mirror while you stop in the bathroom, it'll confuse you and you'll think back to the dream you just awoke from moments ago. "Wow, it's like I'm not even looking at the same person. I remember just a few minutes ago while I was dreaming, I was much heavier than this, and I actually looked older? This is crazy." As you look for your belly, it'll be gone. Your body will be melting, and you'll feel awesome. At this point, there's no turning back. I won't let you. You're about to gain lifetime access to 32 doctor-designed, neuro fat loss workouts. With your nervous system at the root of the programming, you're going to experience faster fat loss than you've ever seen or heard of before. By enhancing the electricity to your muscle, you're turning more muscle 'on' and getting more from every exercise that you do. You're about to be blown away. In addition to filming these exercises for online streaming and a downloadable version for your iPod or other video device, I've created audios to help the 'auditory learners' out there maximize the effect. Using this program at home isn't going to be a problem. I'll hold your hand and give you real, practical examples of household items you can use in place of the only piece of equipment we use in this program, a dumbbell. Plus, I'm going to give you creative workout ideas for various home environments that make exercise more fun for the entire family! Over the last 10 years, I've been taking notes. I've learned what's had the largest impact over tens of thousands of clients, both online and offline. I've listened to feedback, asked questions, and learned from my clients, mentors, and peers. 20% of your efforts yield 80% of your results. This is the 20% you should be focused on 100% of the time to get 400% the result. Worried that this might be above your level? I've got you covered. Whether you've been exercising a long time and you're worried about your form, you could just use a review, or you're brand new to exercise, this guide will teach you the fundamentals and form on all of the basic movements you'll see in any exercise. Learning exercise gets much easier when you go through this guide. Fat loss is a celebration. Victory journals document your success. However, there's a specific method to this that seems to produce way better results and dwarfs using a workout journal. I'm including this for you, as well. In these hour long workshops, I evaluate and treat 3 clients for various issues, including neck, shoulder, low back, hip, and knee pain. 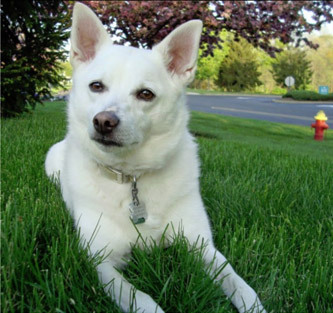 We figure out what's causing it, develop a plan of care that gets superimposed into their exercise programs, and send them on their way. This is invaluable if you have an injury or may in the future. Results are meaningless unless you can appreciate what's happening; and by appreciating what's happening you're sure to see much better results. There's a fundamental mindset switch that takes place in truly successful fat loss clients, both from an exercise perspective, as well as nutrition. 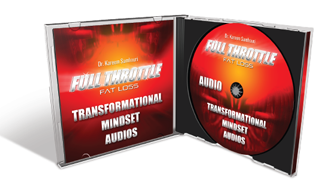 In the Transformational Mindset Audios, I teach you all about the proper mindset for fat loss and fitness, and the fastest way I know to help you get there. Ask me anything you want. This is about you and your results. Nobody gets this access to me without paying $560, minimum, but it's included with your investment today. Immediate action gets immediate rewards. By investing in Full Throttle Fat Loss on Day 1, you're showing me that you're ready to create real change. 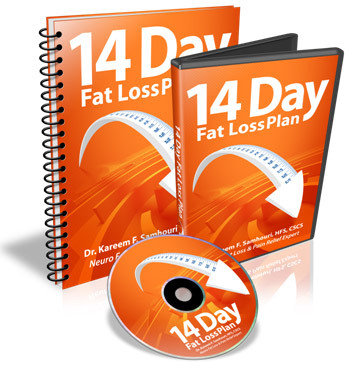 I'm listening, and I'm answering back with the most powerful 14 day fat loss plan I've ever created - FREE. This is about immediate results and simplicity to get started. In the 14 Day Fat Loss Plan, I'm going to show you, in the easiest way possible, how to start losing fat at insane speeds, immediately. I'll tell you what to focus on, how to get more from less exercise, and exactly what to do for 14 days straight. This is about helping you lose at least 7-10 pounds in the first 2 weeks, while balancing your body at the same time. Yes, incredible. How will your body look when you shave off 7 to 10 unsightly pounds and boost your energy at the same time? How will people respond when they see you 14 days from now? 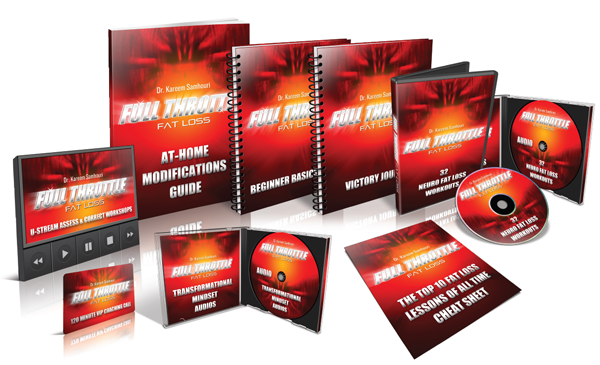 As a special gift for joining the release off Full Throttle Fat Loss, you're going to get this specialty program completely FREE. I told you I'm not holding anything back, and I refuse to let you fail. If you're lazy and you're not going to do what it takes to get lean, then this isn't for you, and you don't have to worry. But let me warn you, your opportunity to take advantage of this special offer and get all of the bonuses is fading away quickly. No pressure intended; I believe in you, but the time to take action if you really want to get results is now. Besides, you've already learned what it takes to design a fat loss program that ensures results. You understand that there are a lot of elements, and that this can be overwhelming in the beginning. Plus, you realize that developing a passion for health can take time, so having a coach by your side is a critical element to your success. I'd like to be your coach, and I'd like to help ensure your results. I know this system works. I know the science is solid and the method has been tested. You're going to get results. That said, if you're unsatisfied in any way, I've got your back. Fitness and health are about having a positive experience, over and over again. If you're not 100% convinced that this is one of the most positive experiences you've ever had with your health, than I'd rather you invest your money somewhere else. As your coach, your goals come first. Whatever it takes, even if it means refunding you the entire cost of the program and directing you to something that may be a better fit for your needs.... either way, I've got you covered. That said, I can't imagine a better fit for you right now. You're reading this for a reason, and you're protected 100% for the next 60 days while you give Full Throttle Fat Loss a "test-run," so to speak, and watch your fat melt right off. If you follow Full Throttle Fat Loss exactly as outlined in the materials and let me plan your fat loss journey, you're going to see better fat loss results than ever. However, if you haven't lost more fat in the first 8 weeks than you ever have in that time period before, just contact us and you'll get a full refund. That's right. Lose more fat than ever in the next 8 weeks by following the program or you get your money back. No hassles, no hoops to jump through, just a prompt, courteous refund. EVERY time you work out? It's time you realize this: mastering anything takes time. You have all the tools you need to ensure fat loss success someday. I'd like that day to be today for you. Modeling is the fastest way to become successful in anything. Take what I'm showing you in Full Throttle Fat Loss and one-up it. Essentially, look at my method, do it, and then figure out how to make it better. This is so much easier than starting from the beginning. Instead of having to orchestrate combining, ALL 7 ways to stimulate your nervous system, ALL 10 Fat Loss Commandments, and the Quadruple Neuro Fat Loss Stack into short, extremely effective workouts, you have an opportunity to work backwards. I've already thought about all of these aspects when designing Full Throttle Fat Loss, and you can do each workout while knowing you're achieving at full capacity in each area. 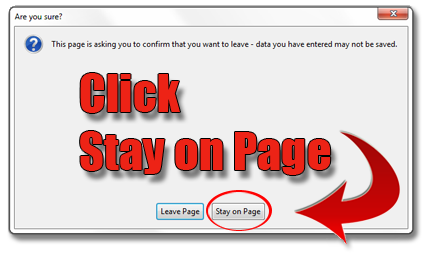 Plus you can do it ALL today while saving $1073 from the total package value and skyrocketing your immediate results with the insane bonus package I've created for you. I'm extremely excited to work with you and see your results. Your body is about to do amazing things, and you're going to wonder how it's even possible that your body got so lean in such a short time period. After years of chasing fat loss and weight loss, you're already home. Today is Day 1. Let's get started. P.S. Full Throttle Fat Loss is meant to help you lose fat right now, but I can only lead a horse to water. 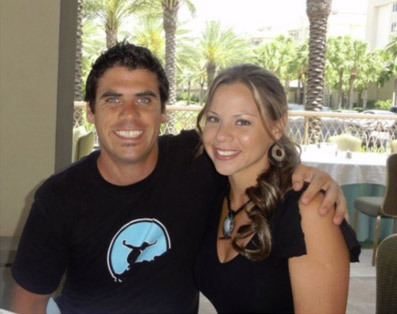 For now, you can secure your lifetime membership today and never have to face the expensive alternative of an in-person personal trainer that may never be able to deliver these results. Click HERE to get started and save BIG! P.P.S. Remember, with my Iron-clad, 100% Money-back Guarantee, I'm giving you 60 risk-free days to discover the body that lays underneath your fat. You'll see it, and then decide. This is the only program in the world that will take your fat loss results to this level, and then also accelerate all of your future results. Grab it RISK-FREE today. 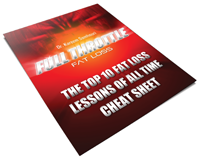 Q: What is Full Throttle Fat Loss and why will it accelerate my results? 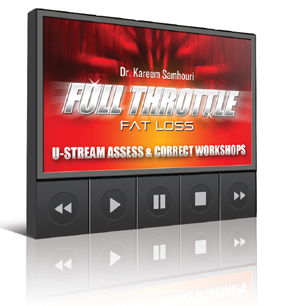 Full Throttle Fat Loss is the first program in the world to integrate all aspects of fat loss, including nervous system stimulation, fat loss acceleration, and a holistic process that looks at the entire 'you' before making assumptions of what will and will not work. 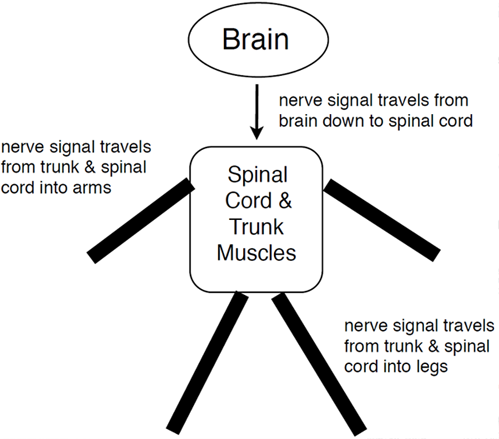 We need faster and stronger signals to our muscles from our nerves. This gets more muscle involved and helps you improve your results, dramatically, with every workout you do. We all have strengths and weaknesses. Working within our strengths 80% of the time is the best way to lose fat at full speed. Stacker Fat Loss always works. By stacking exercises together into multi-part exercises, you are requiring your body to work harder to get through the exercise. This work = metabolism, which means there is an increased metabolic cost with every exercise you do. Full Throttle Fat Loss was designed to help you eliminate time-wasted in your workouts or a plan that wasn't ever going to work in the end. This is about starting the rest of your fat loss journey in a predictable, sensible, and logical way that just makes sense. Your body was designed to eliminate waste. It gets rid of fat when it's signaled to, but you have to first speak the language of the body. That's where most people go wrong. Muscles are silent; they don't speak. Nerves are not silent, and they 'speak' to muscles through electricity. Every nerve innervates multiple muscles. By focusing on enhancing nerve signals to muscles, we naturally activate more muscles, and more of every muscle. It's a double-win. We're all made differently, right? While this is true, there are only so many variations. For example, you might be tall and thin, short and round, short and stocky, etc. By taking a glimpse into your own body and learning what type of muscle fiber you preference, you are automatically setting yourself up for success. Then, when you choose to 'mix it up' and 'scare your fat away,' your body won't know what hit it, and you'll respond just like all those before/after's you keep seeing in the media. 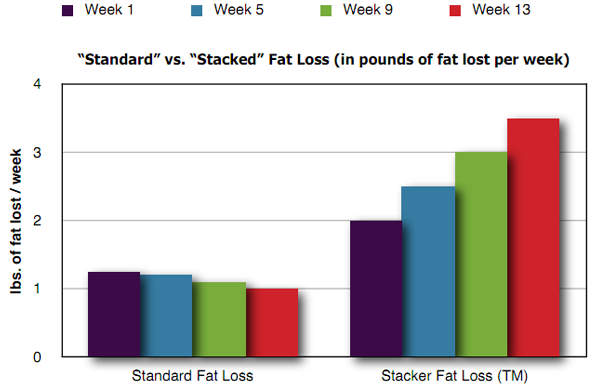 As for Stacker Fat Loss, this is just simple mathematics. Every joint has a local metabolism, and your whole body, or global metabolism, is the accumulation of many local joint metabolisms. Essentially, the more of your joints (or bodyparts) you move, the higher the metabolic cost of an exercise. The more you do this, the higher your metabolism goes, and around we go. Over the next 4 weeks, we're going to prime your body to lose fat at full speed. I fully intend to help you create a 'Metabolic Shift.' This is a moment in time when your metabolism re-establishes 'normalcy' at a brand-new, higher level. Once it gets used to functioning 'faster', it'll naturally make this the new base level, or basal metabolic rate (BMR) for your body. Step 1: Activate more muscle to get more from every rep and increase metabolic cost. Step 2: Stack exercises together and increase metabolic cost of every set. Step 3: Prime your body to lose fat and then create a 'Metabolic Shift', so that you always lose fat faster, from this point on. Q: Is Full Throttle Fat Loss 'too' difficult? That's a great question, and I'm going to flip it back on you. No, it shouldn't be too difficult, but difficult is a relative term. What is difficult for you? If it's a matter of stepping outside of your comfort zone, then, yes, this is going to be difficult. If it's a matter of an exercise being too advanced or a workout program being too intense, that's not the case. 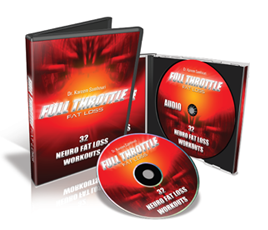 Full Throttle Fat Loss was designed for any level by using some ninja program design to allow any person, at any level, to step in and get a great workout. I wish I had the opportunity to work with everyone I train from Day 1. That would be incredible. You'd never make any form mistakes, or get confused by all of the garbage out there in weight loss. Instead, you'll have a targeted and systematized approach to getting your lean body and losing fat as fast as possible, while keeping you healthy. So, I designed this program for you, if that's the case. On the other hand, I take great enjoyment out of training Olympic and professional athletes. It's really neat to see the potential of your method realized through the most athletic and capable bodies in the world. I always wanted a way to serve both populations, and Full Throttle Fat Loss helped me solve this. As you'll see in a moment, fat loss isn't the only advantage here, so even if you're ultra-advanced, you're in for an incredible treat. Q: What is Rebound Fat Loss? I've only ever heard of Rebound Weight Gain. How is this different? Crash Dieting. Crash Dieting makes it so that your body is in starvation mode and eats its own muscle. Since muscle consumes a ton of energy (calories) for your body, your metabolism naturally decreases over time. Unfortunately, as you reduce your caloric intake and lose muscle at the same time, your body's reward for the weight you lost is less food and a slower metabolism. Rebound Fat Loss is when you hit a fat loss goal, and then you decide to go for another one and hit it faster. Most fat loss programs actually slow down in results over time, no matter how much harder you work to see any change. Q: Is Full Throttle Fat Loss a program that can be repeated? Of course, but you won't need to in order to hit your goals. As you'll see in a minute, I'm going to make you an incredible offer to let me build your workouts for you until you feel more comfortable becoming fully independent, but that's just a choice and a courtesy. 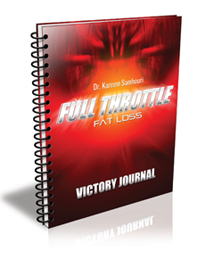 You'll be able to use Full Throttle Fat Loss over and over again, as often as you want. More importantly, you'll understand how to easily switch in/out exercises to the program I already created for you and keep your results coming forever. This is about fat loss independence, and it's about never plateauing again. I'm on your side. Q: What if I'm trying to build muscle or just get a bit leaner? Ok, so this is where Full Throttle Fat Loss gets really cool. Because this is a fully periodized program with distinct phases, you naturally electrify your body into getting lean and activating more muscle within the first 4 weeks. After this point, it's easy to hit any fitness goal you want, whether it's just increasing fitness level or getting bigger. Full Throttle Fat Loss is designed to help your body gain and tolerate more from every workout. These are both essential points in building muscle or improving your fitness level. You've found the 'priming' solution for fitness and building muscle. Q: What if I have an injury? Can I still get results with Full Throttle Fat Loss? Great question. 34 pounds and 17% bodyfat ago, I was in a lot of pain... in fact, I'd say 8/10 pain in most joints in my body. It was terrible, and I was 23 years old. Through simple muscle balancing exercises and good judgment, I was able to lose all of my unwanted bodyfat and regain my self-confidence. I'd like you to be able to do the same thing. The best thing to do if you're injured is learn to work around it. You're creating a faster and better healing environment for your body in doing so. By driving more circulation everywhere in your body through exercising non-injured bodyparts, you're improving oxygen saturation to the injured tissue, and you'll heal faster. It makes sense to get moving. Use good judgment, involve your doctor or physical therapist if it makes sense, and ask questions, but be sure you get started and take action right away. Q: I'm ready to start losing fat now. Is this program going to take forever in the mail? No! The entire program will become immediately available to you via membership login and download after your purchase - no shipping fees, no waiting for results! Q: As a Doctor of Physical Therapy, is it fair to say that you're willing to work with someone who's not in her/his "prime" anymore? Yes, and I specialize in working with people of all ages. No matter what your need or circumstance, I'm here to help. Our youngest client is an 8 year old boy and our oldest is a 93 year old woman. It's working for both. It'll work for you too. Q: What if I'm just starting out? Totally, but only beginners that want to lose fat as fast as advanced trainees and are willing to open their minds and trust the method. In addition to the Beginner Basics Guide that comes with Full Throttle Fat Loss, I've designed each workout to adjust to your level automatically. Plus, I've explained every movement and every exercise in complete detail, demonstrated common form deviations as well as proper form, and shown you the way to 'feel your muscles' while you move. Q: Can men and women both get great results with this program? Of course. 60% of my clients are women and 40% are men. I wouldn't create anything that doesn't work for both of you. 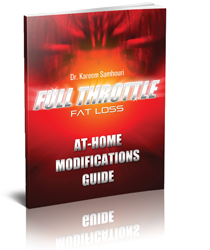 Full Throttle Fat Loss was designed to guarantee you the fastest fat loss results you've ever seen and have you accelerate fat loss results over time. Get ready, we're going to have some fun. Q: What if I don't get results? I know this system works. I know the science is solid and the method has been tested. You're going to get GREAT results. That said, if you're unsatisfied in any way, I've got your back. Fitness and health are about having a positive experience, over and over again. If you're not 100% convinced that this is one of the most positive experiences you've ever had with your health, than I'd rather you invest your money somewhere else. I'll issue you a complete, hassle-free refund anytime within your first 60 days if you're not completely wow'd by what's to come. As you can see, the burden is completely on me. I'm taking all the risk, so you don't have to. You've been let down enough times... not this time. 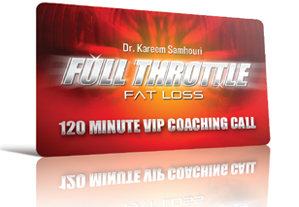 Full Throttle Fat Loss is a great deal this time, and I'm committed to helping every one of you get amazing results. You are the beginning of a new era in fat loss, and I want to ensure you are the example for the rest of the industry from this point on. You've made it this far. You're reading this for a reason, and I'm here to help. I really want to trust you with this stuff, but nothing has worked for me before, and I feel like I've tried everything. Do you really think this will work for me?" "Your body is your body, but your mind is much stronger. Before I can draw that conclusion, you have to decide for yourself. Yes, this program can do what you're looking for and then some, but it all starts with you. You have to believe, with everything you've got inside, that you'll never be the same again and you refuse to quit on your goals until they are realized. Find that inspiration and you've already won. There's no other way..."
No matter what, though, I just hope that you've taken a lot away from the time we have spent together today. There are a lot of other workout programs out there and temptation to buy everything you see, but I truly believe this to be the best program on Earth for fat loss acceleration. If it weren't, I wouldn't have released it. This is about bringing things that are newer and better to the industry, or keeping our mouths shut and learning from the best. ...but, today, we'll do it for the deal of a lifetime and a ton of extra bonuses. This truly is your last chance... to get in shape. Act now, save money, and do something about your frustration. Win with me. Click add to cart. Let's get started.